The 3 seminars (30-35min each) will take place the 18th of December 2017, from 10am in the IECB amphitheatre, 2 rue Robert Escarpit Pessac. Helicenes display a helical topology and extended pi-conjugation which provides them with unique properties. Indeed, they display intense chiroptical activity such as high optical rotation values,1 features that can be very appealing for optoelectronic applications and information technology. One challenge set to chemists is to develop new synthetic strategies for creating structural diversity. In the last years, we have developed the molecular engineering of helicene derivatives using coordination and organometallic chemistry.2 To illustrate the potential of such strategy, I will present examples of organometallic helicenes such as platinahelicene A3 et le carbohelicene-ethynyl-Iron B,4 and their use as chiral luminescent molecular materials and/or chiroptical switches. 1 (a) Y. Shen, C. -F. Chen Chem. Rev. 2012, 112, 1463; (b) M. Gingras, Chem. Soc. Rev. 2013, 42, 1051. 2 N. Saleh, C. Shen, J. Crassous, Chem. Sci. 2014, 5, 3680. 3 C. Shen, E. Anger, M. Srebro, N. Vanthuyne, K. K. Deol, T. D. Jefferson Jr., G. Muller, J. A. G. Williams, L. Toupet, C. Roussel, J. Autschbach, R. Réau, J. Crassous, Chem. Sci. 2014, 5, 1915. 4 C. Shen, G. Loas, M. Srebro-Hooper, N. Vanthuyne, L. Toupet, O. Cador, F. Paul, J. T. López Navarrete, F. J. Ramírez, B. Nieto-Ortega, J. Casado, J. Autschbach, M. Vallet, J. Crassous, Angew. Chem. Int. Ed. 2016, 55, 8062. While molecular cages are often challenging to prepare through covalent chemistry procedures, the metal-driven self-assembly methodology allows a straightforward access to a wide variety of discrete architectures. The resulting cavities offer promising opportunities for applications in host-guest chemistry. In this context, we have focused our interest in the designing of electron-rich self-assembled discrete cavities. The seminar will be dedicated to this new class of metalla-cages, including recent advances related to their ability to trigger the encapsulation/release process of a guest, through a redox stimulus. Ecole Centrale de Marseille, Aix Marseille Université, Av. Escadrille Normandie-Niemen, Marseille. Hemicryptophanes are molecular cages that combine a CTV unit with another C3 symmetrical unit. They have recently received a growing interest and were found to act as efficient receptors, or chiral molecular switches, but their most remarkable feature is the possibility to achieve the endohedral functionalization of their molecular cavity. 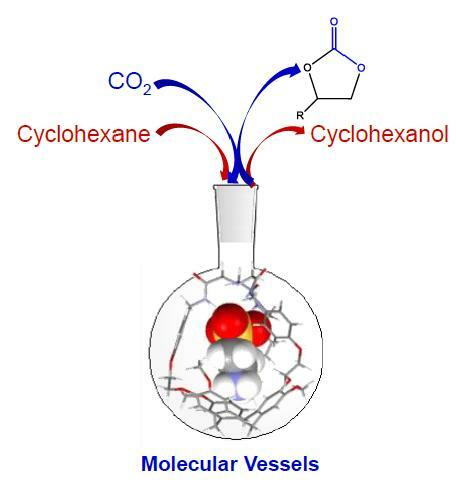 The resulting confined catalysts have been tested for instance in C-H oxidation or CO2 conversion. The encapsulation of the catalytic species was found to improve the stability, rate or selectivity of the reaction making this class of supramolecular catalyst specially promising.